As the founder of Faithful Workouts and The Fresh Table, I love to cook and I especially love to prepare healthy, life giving meals. Even during the holidays, I love to eat healthy because I just feel better when I make eating this way a lifestyle choice and not a “diet”. My husband and son are both gluten and dairy free so I feel I’ve mastered the art of GF and DF cooking. If you need to take out gluten and dairy from your holiday meals or you just want to prepare a Thanksgiving dinner that is healthier, that doesn’t mean you have to sacrifice delicious, great tasting foods. In this post I am going to share with you a complete Thanksgiving meal that includes my personal favorite recipes. This is also the meal I plan to cook and serve my own family this year. Even if you don’t need gluten and dairy free recipes I still highly recommend all of these recipes. All of the Thanksgiving dinner recipes included are for 8-10 people (depending on how hungry they are!) I’ve included a soup, salad, four sides and a dessert. I recommend cooking the turkey the way you and your family love most. Part of the fun of Thanksgiving are the leftovers so be sure to make enough so you can enjoy it with some other fun recipes for a few more days. All these recipes are gluten and dairy free but loaded with flavor. I grew up eating a lot of home made soups. I think my mom was one of the best soup makers ever! I still love soups and make them often, especially living in Colorado. 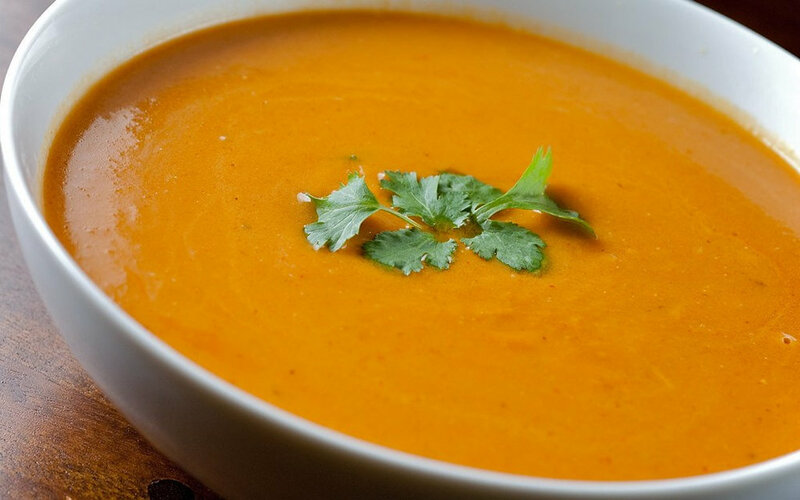 This Curried Squash Soup is one of my favorites because of the savory taste of the squash, the subtle sweetness of the apples and the spice of curry powder. Heat oil over medium heat in a large pot. Add onions, garlic and apple and sauté about 5 minutes. Add squash and broth and bring to a low boil. Reduce heat and simmer covered until squash is very tender about 20 minutes. Remove from heat and puree in blender in batches until smooth. Add 2 tbsps. curry powder stir well and taste. Add additional curry if needed and stir well. Obviously, Thanksgiving can be a heavy meal so I like to include this salad which is flavorful but also very light. Put the lettuce into a large salad bowl. Sprinkle the fresh dill over the lettuce. Top with green onions and blueberries. For dressing put all ingredients in small bowl and whisk. When ready to serve pour dressing over lettuce and top with crumbled goat cheese (optional). This recipe holds a special spot in my heart. 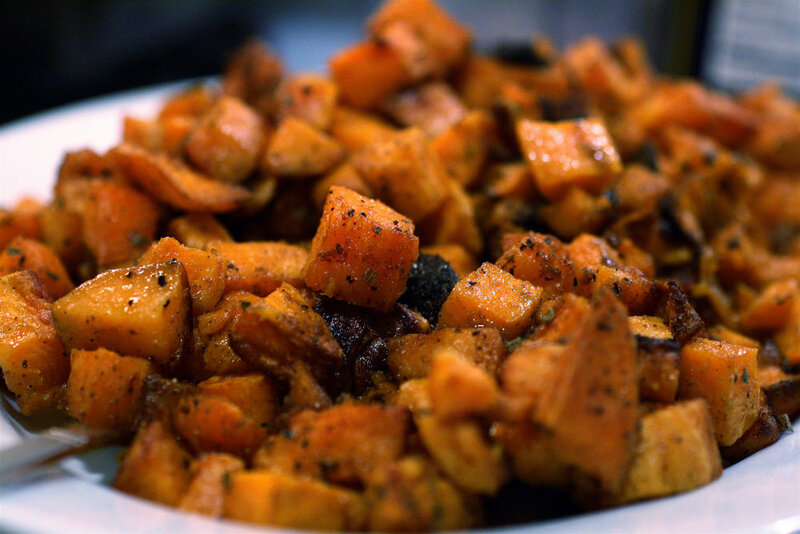 I remember cooking this gluten free stuffing recipe with my father-in-law. He was one of my all time favorite people. He was a family loving, Italian guy who also loved his food. He was diagnosed with Celiac late in life but he adjusted and continued to love being in the kitchen and I loved to cook with him whenever we were together. Preheat your oven to 350 degrees. Place bread slices directly on oven rack and cook until crispy on both sides. Remove and cut into bite sized pieces. Heat 1tbsp. olive oil in a large pan over medium/high heat. Add the Italian sausage. Stir and chop on the sausage into small pieces as it cooks. Cook for 4 minutes or until almost cooked through. Add in the onion, celery and garlic and cook, stir and cook for about 6 min. Add bread cubes, broth, tarragon and parsley into the pot. Hold the rice cakes in your hand and crumble them into the pot. Stir well. Taste and add salt and pepper if desired. Use 1 tbsp olive oil to coat a large baking pan. Pour stuffing into pan. Bake for 45 min. Can sit in fridge for up to 2 days before cooking. Of all the vegetables I eat, green beans remind me of my mom. Growing up green beans were apart of many of our meals. My mom typically made them the same way which is this recipe. One of the things I love about food is can stir up memories from your past. I am so thankful that my mom taught me from little on that the best foods are the ones you make yourself with fresh ingredients. Any Thanksgiving meal just isn’t complete without a delicious cranberry sauce. By delicious I don’t mean that jelled stuff that comes out of a can. Again, I love the variety of flavors in this recipe. The tartness of the cranberries, the spiciness of the jalapeños and the sweetness of the oranges is amazing when put on a piece of turkey. It’s funny I always thought I hated cranberry because of the canned version. It’s amazing how much better fresh version tastes. In a small pan, combine cranberries, water, sugar and jalapeño pepper over medium heat. Stir, cover and simmer for about 5 min. or until cranberries or softened. Add oranges and lime juice. Stir and cook additional 3 minutes. Once it’s room temperature cover and put in fridge. Can be made up to 3 days in advance. If you ask my boys what their favorite part of our Thanksgiving meal is they would probably say the mashed potatoes and they both love this version. Dice up your potatoes and cauliflower into bite-size pieces. Fill a large pot halfway with water. Bring to a boil. Add potatoes, cauliflower and garlic. Cover and cook at a low boil until cauliflower and potatoes are soft (approx. 30 min) Once cooked, drain the water out, and then put cauliflower, potatoes and garlic back into the pot. Take a sharp knife and kind of chop through your potatoes and cauliflower while they’re still in the pot, just to make the chunks a bit smallerAdd in olive oil and 1 cup almond milk and blend with hand-held blender. You may need to add additional almond milk to get desired consistency. Add in salt and pepper to taste. When ready to serve sprinkle the fresh parsley over the top. I think my boys would like me to make the traditional mashed sweet potatoes with marshmallows but my daughter and I love this version better so the girls will win this year! Put diced apples in a 13 x 9 pan. Sprinkle 2 tsp cinnamon over apples. In a separate bowl combine 1 tsp cinnamon, maple syrup, coconut oil, oats and almond flour and mix well. Should form a crumbly consistency. 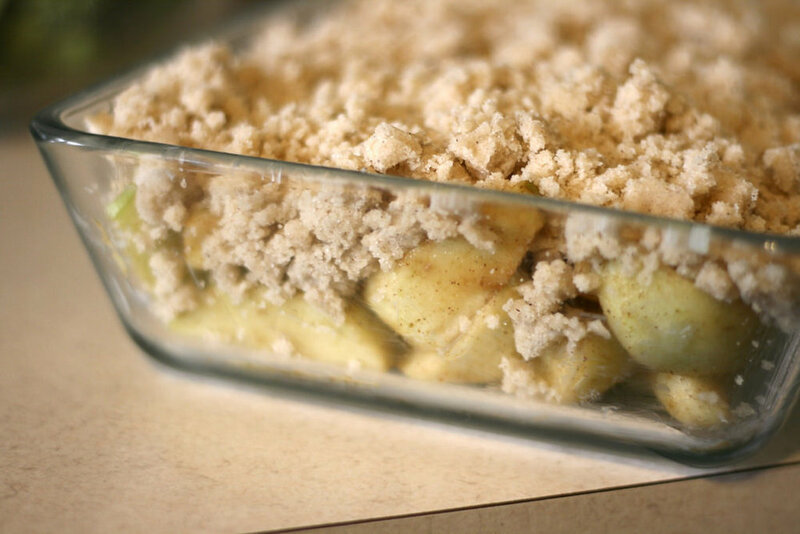 Crumble over apples. Bake in preheated oven at 375 for approximately 40 minutes. This Thanksgiving meal is much healthier than the traditional recipes you will find and won’t leave you feeling guilty for indulging in some heavier foods for the holiday. A definite win/win in pursuit of a healthy lifestyle! Need to access this recipe quickly? Use this graphic and pin it straight to your favorite recipe board for easy reference later! Michelle is the founder of Faithful Workouts and The Fresh Table. She began her fitness career in 1984 and still loves to help people break free from fitness frustration and move towards a life that's full of physical and spiritual health. Michelle is married to Jeff and they have three children PLUS two lovable dogs.